Readers credit her articles for calling attention to dogs in need and helping to save lives. 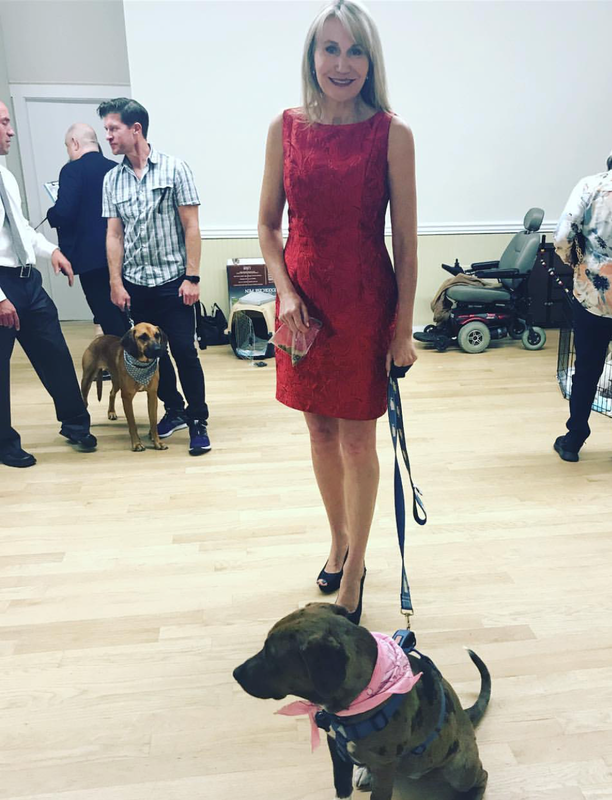 Watchdog Mary takes part in the event "Rescue to Runway," a fashion show where the real stars are the four-legged models! "WatchDog Mary" is an investigative journalist with more than 20 years experience. Mary Schwager, aka "Watchdog Mary," has won more than two dozen local, regional, national and international journalism awards for investigative, consumer, feature reporting and writing, including 14 Emmy Awards and seven Edward R. Murrow Awards and numerous Associated Press honors. 2017 Emmy Award Winner, #14! Mary has worked as a television reporter, investigative reporter and investigative producer at network affiliated stations across the country in Cedar Rapids, Iowa, Milwaukee, Wisconsin, Indianapolis, Indiana and Boston, Massachusetts. She has chased after infamous criminals like Christopher Scarver, the man who killed serial killer Jeffery Dahmer in prison. Mary interviewing Christopher Scarver, who rapped a song in response to her question. Recently Mary attempted to interview William “Rick” Singer, the mastermind behind the nationwide college admissions bribery scandal. She asked him why he gamed the system. Her "Consumer Watchdog Mary" videos aired nationally on "The Daily Buzz" morning show. As a print journalist Mary's articles have appeared in Galtime.com, Huffington Post, Yahoo, Fox Business News, Grit Daily and Just Labs. Now Watchdog Mary is using her talents to report about animals. She writes for the popular online magazine, The Dodo. She was also the Facebook live roving reporter (some might even say the “rover reporter”) for I Love My Dog and its 5.5 million fans. She's written dozens of national columns for Examiner.com, some resulted in changes being implemented in municipal shelters. Her article about hunting dogs being "freeze branded" and dumped appeared in Yahoo. Watchdog Mary's inquires sparked web giant Amazon.com to remove a sales category it called "animal breeders" from its website. She was one of the first journalists to write about a change in federal tax rules which made fostering an animal for a nonprofit rescue tax deductible. And even with the new additions to federal tax laws, fostering is still deductible. Watchdog Mary was also a state licensed detective and conducted criminal and insurance fraud investigations after she graduated from Marquette University in Milwaukee, Wisconsin. Marquette Magazine (page 34) featured some of Mary's accomplishments. Mary always had a love for animals. Growing up she had parakeets, chameleons, fish, dogs and guinea pigs. In college she and her roommate had a cat and a rabbit. The pair actually got along! The cat would paw at the bunny's nose, he took it as a sign of affection and loved it, despite her claws. The two animals, both litter box trained, made for some wonderful moments. The very first dog Mary adopted was abandoned when the pup was about three-weeks-old. Ever since she has always adopted rescue dog after rescue dog. So has the rest of her family. In her 20’s Mary started volunteering with dog rescue organizations, she still volunteers, and says out of all the things she's ever done rescue is one the toughest and most challenging. Watchdog Mary was the guest speaker at the "Last Hope K9 Rescue" gala in Boston. She's seen here talking about animal issues and sharing her insight and articles.